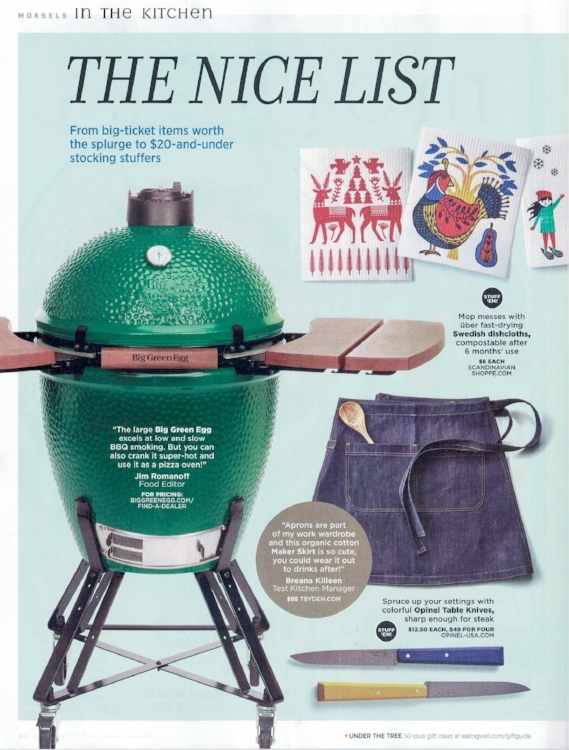 We made the Nice List :) We are honored and thrilled to be in the gift guide of the November/December Eating Well Magazine with the Maker Skirt!!! They noted that our skirt is just as at home in the kitchen as it is in the club… Put one on and try it out. Twelve years ago, Tove Ohlander started buying apparel from by Dem, a clothing business in her native Sweden. She liked the company's focus on socially and environmentally sustainable manufacturing and the fact that it was woman-run. Now, Ohlander has brought the brand to the U.S. with T by Dem, her new, independent affiliate of by Dem. She opened her new shop last week on Burlington's Pine Street behind AO Glass, the facility she founded in 2007 with husband and fellow glassblower Rich Arentzen. Much of the clothing that T by Dem offers comes from the company's existing line, including T-shirts, polo shirts, tank tops, hoodies, chef's coats, and white and denim button-downs. Ohlander has also contributed a design of her own: the maker skirt, a hybrid of a wrap skirt and an apron designed for industrial femmes. She says she'll continue to work on new designs with by Dem and its partner factories in Sri Lanka and India. The maker skirt was inspired by Ohlander's own experience as an industrial maker. In the city's South End, she works in close proximity to other artists and artisans, as well as to food-service professionals at neighboring restaurants and cafés. The maker skirt has been "in the back of my mind as long as I worked in the glass industry producing things," Ohlander says. "When you're at work on a daily basis, or when you're out — we've done farmers markets and events at Hotel Vermont — you want to look somewhat presentable, but you also want to be functional. Then where are the clothes? What is it that's not just jeans with pockets?" she queries rhetorically. Unable to find what she was looking for, Ohlander made it herself. Unlike a traditional wrap skirt, the maker skirt closes in the back, so the flap doesn't get in the wearer's way. And, unlike typically pocket-free women's clothing, this skirt has two large front pockets for tools and notepads. Keys can be clipped to a sewn-in hammer loop, and a cellphone pocket on the side keeps the device away from sharp objects or worktables. Available in two lengths, the skirt can be worn alone or over pants like an apron. It retails for $95 to $130. Like the South End itself, Ohlander's new operation is evolving. Currently the store occupies a small corner of AO Glass, which will expand over the next few months to accommodate increased production. Until that renovation is complete, Ohlander won't know for sure where T by Dem will settle; interior rental studios in the large warehouse are shifting, too. Wherever she ends up, walk-in retail for maker skirts, tees and other apparel will be part of the business. Ohlander is also taking wholesale orders for companies in the Burlington area and beyond. Locally, she says, she's in negotiations with some food and beverage professionals. Scandinavia-based customers include the Barista League, an organization that runs events for coffee professionals; and Oatly, which makes oat milk. Ohlander's maker skirts are also available at Common Threads on Battery Street and in the Storsjöhyttan glass studio in Östersund, Sweden. "There is a lot of talk about local business in Vermont," Ohlander writes in an email. "What I am intrigued by is that we are collaborating with two other small companies that just happen to be local in other locations of the planet — a redefinition, perhaps, of what it means to buy local." Ohlander's products travel long distances to reach her, but their sourcing and manufacturing are ethically and environmentally mindful, she says. All of by Dem's cotton is certified and organic, colored with sustainable or natural dyes. (Upcoming versions of the maker skirt will be dyed with turmeric and other plants.) The clothing is sewn at two factories that pay livable wages, with healthy working hours, in Sri Lanka. And, when possible, the company "prioritize[s]" shipping methods that use fewer fossil fuels, according to its website. Annika Axelsson and Karin Stenmar founded by Dem in the early 2000s. The women have since received "green" awards in Sweden for their work. Axelsson frequently speaks publicly about sustainability and the textile industry. So far, Ohlander's maker skirts have received accolades for more than their conscientious conception. Sas Stewart of Middlebury's Stonecutter Spirits calls hers "the most practical and beautiful apron" she's ever worn, and ordered some for her staff. She's currently talking with Ohlander about how to modify the skirt for men. Ohlander says she makes a point of working with businesses that share her ideals. "We are supporting family-run small enterprises whose values I respect," she says, "and are making the world a bit smaller, friendlier and definitely more sustainable." "Chemicals are not needed, it is something that is imposed retrospectively," says Annika Axelson, a producer of organic clothing to Ekot. Every year about 13.5 kilograms of clothing and home textiles are consumed per person in Sweden. Although more and more Swedish companies in the industry want to be more environmentally friendly, sustainability efforts are slow. This is the outcome of a dissertation by Natasja Börjeson at the Department of Science, Environment and Technology at Södertörn University. After travel, food and housing, our consumption of clothing and textiles, together with electronics, is the one that affects the climate most, according to the Swedish Environmental Protection Agency. Production requires, among other things, high levels of chemical use and water consumption. In her thesis, N.B. has investigated how Swedish clothing companies and other purchasing actors in the textile industry handle the chemical hazards found in textiles. In recent years, several Swedish companies have begun to take greater responsibility for the chemicals used in manufacturing, according to N. B. "In particular, you have become aware that this is a problem. And besides, there are many more who really try to do something about it. But despite this, companies' sustainability work on chemicals is slow, says N.B. "Among other things, it is slow because chemicals are difficult. There is generally a fairly low level of knowledge about them. Many of these chemicals are toxic, they are harmful to us and to our environment, and therefore we must handle them somehow. One reason for this is the global textile industry, where production is often done in other countries and rarely owned by the clothing companies themselves. It makes it difficult for Swedish companies to claim the chemicals used in the fabrication of the clothes. In addition, there is no legislation to lean against which makes it difficult for companies to live up to their sustainability goals, "said N.B. "Many of the requirements are voluntary, it is perhaps easy to make demands, but difficult to ensure that they are complied with when there is no regulation to fall back to. Another reason why the sustainability work is slow for companies is that there is no one who is ultimately responsible for the entire textile chain, "said N.B. But it is possible to get around the problems. At the Gothenburg-based clothing company By Dem you have insight into all production steps, from the cotton harvest in India for sale in Swedish stores. But that requires more time and dedication. - In part, we have looked very carefully, we know where the raw material is from. I'm there, on the spot, when the cotton is picked, says Annika Axelsson, one of the company's founders. For fifteen years, the company manufactures clothing of organic farmed cotton without the use of toxic pesticides. For the dyeing and printing they use natural dyes like turmeric or chemicals that are controlled and certified as harmless. "We have used clothes in ancient times without harmful chemicals, so to produce without them is of course possible. They are not needed, it is something that is imposed retroactively because we will produce so quickly, so much, and so cheaply, says Annika Axelsson. Natasja Börjeson has difficulty seeing how the work on phasing out hazardous chemicals can be accelerated. "I have difficulty seeing any concrete solutions in this loose structure. It's all about everyone having to work forward and try to get on. "But then I would like to see greater political responsibility for this. I would like to see major structural policy solutions, says N. B. The Production Company By Dem shows that it is possible to produce cotton clothing that protects both humans and the environment. In addition to its own clothing collection, product development is provided in material, design, production, design and concept - all durable, transparent and fair. - When you buy a t-shirt for US $5 you can be absolutely sure that it has been produced under unethical and environmentally hazardous conditions, says Annika Axelsson, founder of the clothing and production company By Dem. Ever since the start in 2002, the company has been at the forefront of textile and clothing production, which takes into account both human and environment. In 2009, for example, organic and ethically produced jeans were produced. Now they are going to launch jute clothes, a natural material that is completely recyclable. "Textile and oil production are the two industries that cause the most damage to the environment," Annika tells us when we meet her on Stenkolsgatan in Gothenburg.